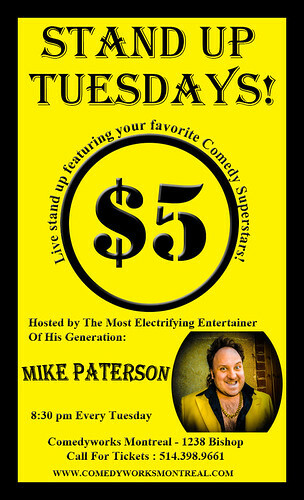 Mike Paterson Hosts a New Live Comedy Show Tuesday Nights! MONTREAL, CANADA- The comedy world was exhilarated today with the news that comedian Mike Paterson would be hosting a brand new live comedy show on Tuesday nights at the Montreal Comedy Works. The Montreal native is known for presenting such popular shows as Five Dollar Tuesdays at the Comedy Works, Tuesday Night Out with the Dan D Lyons at Brutopia, the Mike P Electrification show at the Comedy Works, Just For Laughs Triple Threat at the Comedy Nest, and Just For Laughs Best of the Fest at the Comedy Works. He was excited to announce the new format for Tuesdays when the Stand Up Tuesdays was announced earlier this week. “It’s an exciting time for Montreal Comedy” Jimbo, owner of the Comedy Works said, “with so many talented people performing comedy in the city, having a stand up comedy night on Tuesdays just made sense. Plus you can’t beat the five dollar price tag for such an excellent show” Reservations for the Tuesday night show can be made by calling the Comedy Works at (514) 398-9661. As always when Mike Paterson is involved, the possibility for zany, out of the ordinary comedy will be high. Paterson alluded to the possibility of musical comedy, guest wrestlers, and even the occasional mime. For fans of traditional stand up comedy, there will be plenty to sink your teeth into as well with weekly headliners picked from some the best comedians in Canada and special guests coming by from all over the country to perform at one of the most talked about shows in the city. Call to make reservations today for a Tuesday night out to remember!